A robot developed by engineers in Taiwan can pour coffee and move chess pieces on a board against an opponent, but he’s looking for a real job. 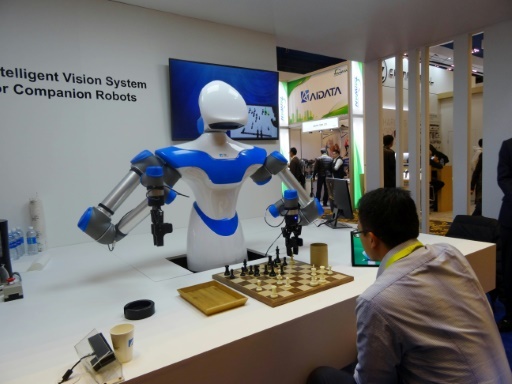 The robot developed by Taiwan’s Industrial Technology Research Institute, which spent the week playing games against opponents at the Consumer Electronics Show, was displaying what developers call an “intelligent vision system” which can see its environment and act with greater precision than its peers. Playing chess is just a hobby showcasing the robot’s visual acuity—such as the ability to distinguish between different chessmen—and dexterity in gripping and moving objects. The vision system can recognize objects and their location with greater precision than other robots, said ITRI division director Lewis Liu. “Traditional robots use pre-defined points,” Liu said. This robot “has more flexibility” to locate and manipulate an object, with a robotic version of “hand-eye coordination,” Liu said. In an industrial setting, it would have greater flexibility than other robots in adapting to new situations. Instead of being programmed for a single task in a defined space, it could recognize when a component is a different size or a different location. The institute is not commercializing the robot, but he is available for work in a service or industrial job through an investor or partner, according to Liu.